What a Saturday: Steve Nygren showed us around Serenbe. If you've been around Atlanta much, you'll recognize Steve. He's giving an incidental thumbs up. It was actually an artist talk from the man who has the whole concept in his head. 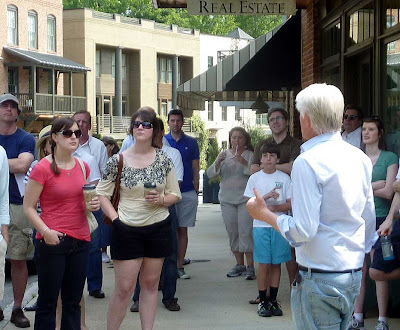 We got a walking tour, a house tour, a neighborhood tour, a new urbanism tour, a government relations tour, and a land use planning tour, a TND tour, a sustainability tour, a form based code/transect tour and more. Steve even showed us his kitchen and introduced his dog. That's what we give our highest awards for. For me the day started with a carpool meet-up at Glenwood Park with some Young ICA&A folks. That's Clay Rokicki in the baseball hat and Capella Kincheloe in the straw hat. You know who they are, right? The Young Institute of Classical Architecture and Art (Young ICA & A) put the event together. If you join the ICA & A, you'll find out about events like this. So join already! We rendezvoused at Serenbe's Blue Eyed Daisy Bakeshop and Steve took it from there. Here is Steve discussing using porches instead of lawn chemicals. Then we went for a walk, taking advantage of the Omegas. Ask me about Omega design some time. To a southern vernacular single family. This shape is etched my brain from childhood drives in Randolph County with my parents. A shady hill-side balcony in the live-work building. Steve led us down some stairs to a gravel courtyard with arbors and fountain hiding 30 geothermal wells. It's by Ryan Gainey. We followed Steve another few steps to a shady gravel path that linked Omegas. We couldn't see houses from the path but we soon emerged on a street of single families. Steve told about porch requirements, yard requirements, streetlight requirements, and the composting garbage concierge. It seemed like a lot of requirements. But Steve's explanation of the concepts helped us grok the details. This was an artist's talk after all. We took another path through the woods to the dog trot house. I'd be happy with the steps, even one step like these. We'd only seen a tiny bit of Serenbe but it was plenty to get us thinking. Thanks to Steve, the Young ICA&A, Colleen O'Keeffe from Historical Concepts, and fellow tourists, what a pleasure. Before I leave I want to mention folks I've met via my blog who have Serenbe connections: Peter Block designed the Serenbe Stables. Lance Carlson and Marc Mosley of Carlson & Mosley Architects worked with Ryan Gainey on Serenbe landscapes. Designer and blogger Claire Watkins just happened to be visiting Serenbe. I am a huge fan of Serenbe, loved this post. The shady hillside balcony image reminded me of my childhood in Savannah. What bothers me about Serenbe is that it creates a living space where -- let's face it -- the working poor and lower middle classes are kept at a massive distance. So you are sold a celebration of American folk life with 50+ % of the folk simply not there. If you're going to go that far, you may as well install a golf course and skip the new urbanism / sustainable pretense. "the working poor and lower middle classes ...kept at a massive distance" didn't start and won't end with new urbanism. It was great to meet you too! I will certainly bookmark your blog! Thanks for this post. At first I thought of Serenbe as rather plastic fantastic or Stepford. But now I have a few friends who live there and after spending time there I understand and appreciate it much better. I really have to give Nygren much credit for what his doing. Aesthetically it's well done. I love the architectural vernacular of most of the homes and I think the emphases on renewal, organic and community is wonderful. At least he's doing something! Hat off to him. My sister & I visited today for the first time. We loved it, thanks all the links & photos. Lots of friendly folks who live there and are very happy. The Bosch house impressed me the most. Oh, and the landscaping. And the lovely diversity of architecture. While I couldn't live down there - too much isolation from a larger city - I commend Steve for his vision of a grand eco-community. And in fact he came over to our table at The Hill and chatted for a while. He gave us decent directions home. We'll go back. The little one that moved twice. Teardown 2/3's Done, Arches and Gables.